A major change seen from the Indiana legislature is the phasing out of the inheritance tax by SEA 293; that was spread throughout article 6-4.1. Make sure you're covered on and aware of these big impacts to the tax code with this section of Burns Indiana Statutes. A major change seen from the Indiana legislature is the phasing out of the inheritance tax by SEA 293; that was spread throughout article 6-4.1. Make sure you're covered on and aware of these big impacts to the tax code with this section of Burns Indiana Statutes. 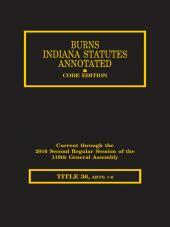 More tax law is covered in Burns Indiana Statutes Annotated - Taxation: Inheritance, Financial Institutions, Misc. / (7 - 7.1) Alcoholic Beverages (T. 6, Articles 7 - 9).